We present XPathLog as a Datalog-style extension to XPath. The querying part extends XPath with binding variables to XML nodes that are “traversed” when evaluating an XPath expression. Data manipulation is done in a rule-based way. In contrast to other approaches, the XPath-based syntax and semantics is also used for a declarative specification how the database should be updated: XPath filters are interpreted as specifications of elements and properties that should be added to the database. In this paper, we focus on the theoretical aspects of XPathLog. XPathLog has been implemented in the LoPiX system [LoP01]. A. Deutsch, M. Fernandez, D. Florescu, A. Levy, and D. Suciu. XML-QL: A Query Language for XML. In 8th. WWW Conference. W3C, 1999. W3C Technical Report, http://www.w3.org/TR/NOTE-xml-ql. W. May. 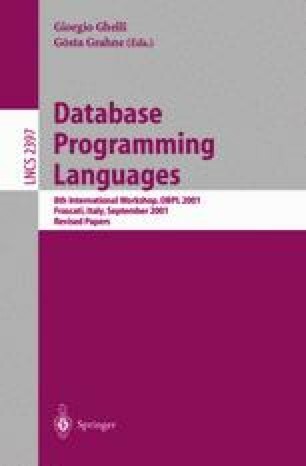 A Logic-Based Approach for Declarative XML Data Manipulation. Available from http://www.informatik.uni-freiburg.de/~may/lopix/. P. Wadler. Two semantics for XPath. 1999. http://www.cs.bell-labs.com/who/wadler/topics/xml.html. W3C-The World Wide Web Consortium http://www.w3.org. XML Path Language (XPath). http://www.w3.org/TR/xpath, 1999.